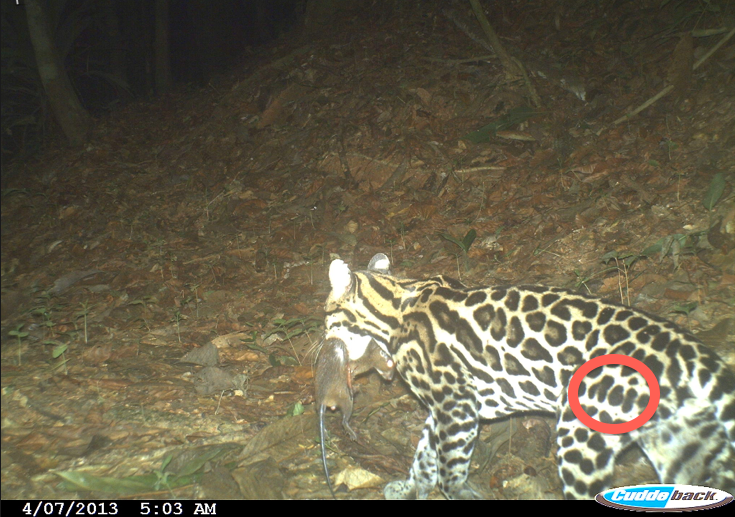 Ocho Verde Camera Trap Update: First year in Review! In May of 2013, we began this campaign on crowd-funding site Indiegogo. 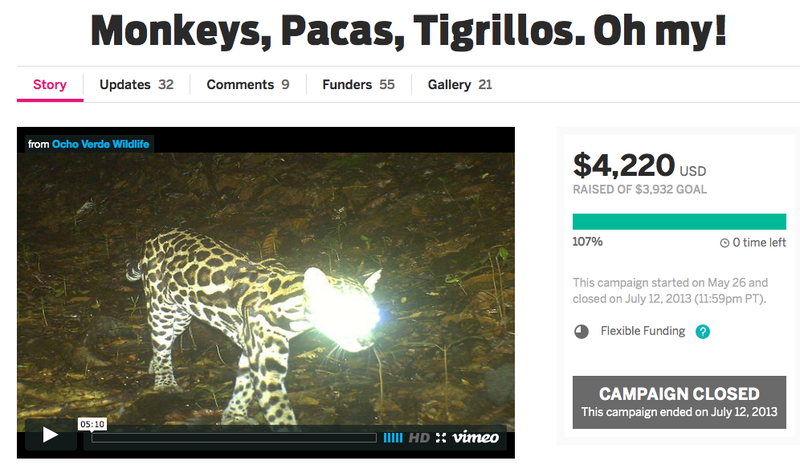 The goal was to raise enough funds to purchase camera traps and support materials to do a thorough survey of the biodiversity of the Ocho Verde wildlife reserve in southern Costa Rica. Well, a year has passed...the results were EXCELLENT! Ocelots--at least 3 of them, possibly as many as 5 of both sexes. Most encouraging, is that the ocelots, agoutis, pacas, coatis, spiny rats, anteaters, tinamous, and squirrel monkeys that we have seen, have offspring. Reproducing animals certainly make for a healthy forest ecosystem. Paca mom and young paca. So far, we can identify 3. 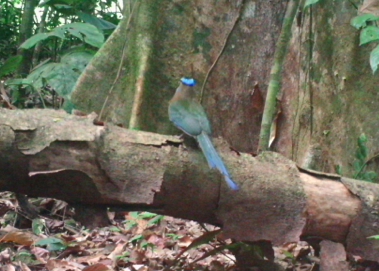 ... and "Big Male"(note that Big Male seems to care less about the bright camera lights). We are continuing to look at the ocelot rosette patterns to help identify more individuals. All of the cameras were placed on established trails,with one one exception. 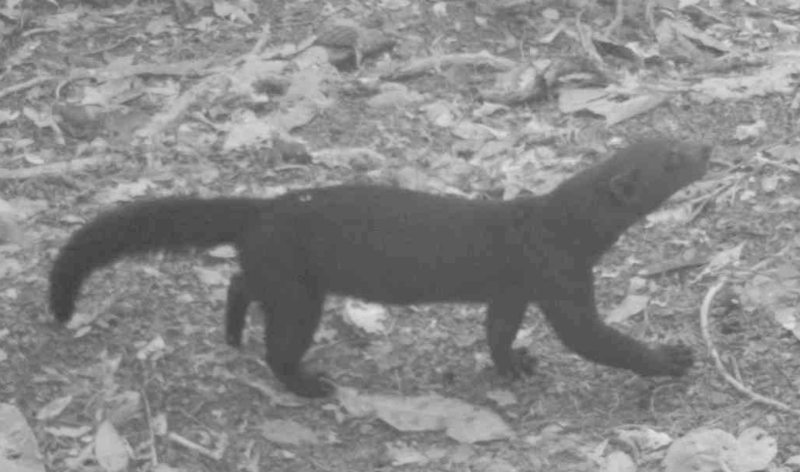 The coatis, jaguarundis, tayra, common opossums, and ocelots were seen at the most distant camera, nearest camera, highest camera, and lowest camera. 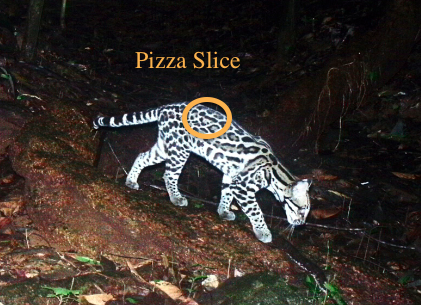 For example, Ocelot Pizza Slice, was seen on all of the cameras. We believe this to mean that animals like and use the trails. We also have seen animals following 'animal' trails into other parts of the forest. The only unestablished trail is the tree that is crossing the creek, which animals, of a all sorts, used as a bridge. The Bushnells and the Moultries recorded thousands of images of varying degrees of quality. While sharp images don't make good fodder for blogs, you can glean a lot of information from them. The Bushnells were far better on battery consumption and durability, and not so great on consistent image quality. The Moultries made ok videos and ok pictures and were ok on battery power. The color HCO Scoutguards do make nice images for videos with good color night and day shots, but seem to run out of battery power faster than the other cameras. The old Cuddeback worked great until it failed(nearly 4 years of use). The new Cuddeback was pitiful from day 1 in both image quality and battery use. We now have a Browning to add to the mix. The good news about the cameras is that all have been serviced/repaired or replaced under their great warranties (we are still talking to Cuddeback about a solution). We thank the manufacturers for sticking with us through our adverse situations. HCO Scoutguard had offered us a wireless camera to use. It did not arrive in time to deploy on the July trip, but we have it in house now and it is ready to go. A second wireless camera has been contributed by an individual. The route will be animal->camera->cell tower->email address, in early real time information. We hope to work with an international organization to get the info out to the WWW(more about that when it happens). Needless to say, we are very excited by this and sincerely thank them for the contributions. No project is without it's share of setbacks and problems. 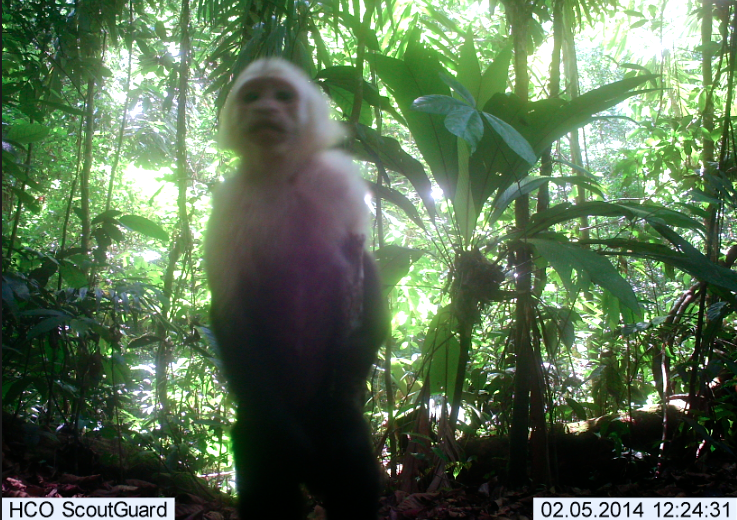 Camera traps aren't really made for jungle environments. Many of the infrared cameras had problems finding enough light to make make color pictures during the daylight and 'flipped' to night-time mode. This is why you see black and white images during the day. The color cameras had similar problems as well: not enough light for a slow shutter-speed. We had our share of leaky batteries. Sensors failed, causing the cameras to continuously take pictures until the batteries died. Leafy plants sprang up in front of lenses. Spiders seemed to enjoy making webs on the lenses. One camera was partially infiltrated by ants. Good cameras sometimes failed for unknown reasons. Perhaps it was the humidity. While we did see poachers, they did not see us(we think). In an entire year there were only 3 days when they were caught on camera, none had any game. 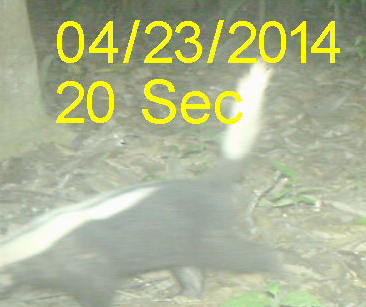 This is a screen shot from a video of the skunk. Remember, that you can subscribe to this blog or follow on YouTube.